Graham McTavish, James Nesbitt, Stephen Hunter, Jed Brophy, Peter Hambleton, Adam Brown, Aiden Turner, Dean O'Gorman, John Callen, Mark Hadlow, Mark Ferguson, Daniel Falconer and Paul Tobin. Me and my friend will are going from Wales (UK). Super excited! Wish I could figure out a way to get to Germany, though. Nothing like this coming up here, and they won't get this crew to DragonCon! I still have the pamphlet here on my desk actually. I'm from Germany so it wouldn't be too much of a trip for me. But I haven't got any friends interested enough to come along, and I haven't ever been to a fan convention before, and I'm afraid I'd be quite lost there, haha. But I'm looking forward to reports. I'm sure you'll have a wonderful time. I'm actually tempted to go, and I'm in the US. I have been going to RingCon for a few years now and when I saw this one promoted I registered immediately! RingCon is always superbly organised. Lots of moments for the stars on stage, photoshoots and autograph sessions. And yesterday they announced Daniel Falconer and Paul Tobin from Weta will be there! And if you come alone, we can always do a moot, there are enough locations around the venue to meet up! I booked my ticket and hotelroom at the event. I have an Economy Ticket. Gold Ticket is way too expensive. And the autographs you get, that takes up so much time! The Gold Ticket owners are allowed earlier into the signing sessions. But it fills up pretty fast and you are probably the entire session on Sunday and half the session on Monday busy collecting all the autographs. Of course it is different here that you probably would like to have autographs of all the stars (I mean, dwarves). At RingCon they have various fandoms. I'm not really interested in the vampire series True Blood and Vampire Dairies, but you do get the autographs of the stars who are present. Of course, I live in Atlanta, so it's a bit of a cheat. 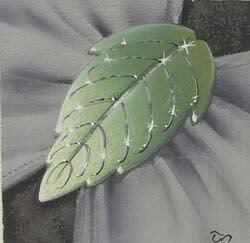 But TORn always has an amazing presence there, with great programming. I agree on autographs--they take a lot of time out of your day, and can be very expensive. I will say that I got Sean Astin's at the 2008 DC, and he was lovely. We talked politics (to the chagrin of his handler, who wanted me to move on). as he had been a big Clinton supporter and was just moving on to the Obama team. I don't think you get to have that much interaction with most people, though. And if you are going to try to get all the dwarves that are there, that would be a lot of work! Look at my avatar !! He was really amazing! Indeed, he took a lot of time to talk with all the fans. I was doubting if I wanted him to make the autograph to my real name or to Rosie. In the end I decide on Rosie. And when he signed it he wrote on the picture himself "with the ribbons in her hair" and started the rest of the quote "if I ever was to marry anyone, it would have been her". Of course I told him he could write that on the picture as well *still smiling when I think of that*. If one isn't intersted in autographs? Seriously, I haven't got a clue what to expect. Is autograph hunting the main reason to go? I've never been an autograph chaser, I've always failed to see the point. is there anything new and intersting to see or learn on these things? I'm also not a autograph hunter. 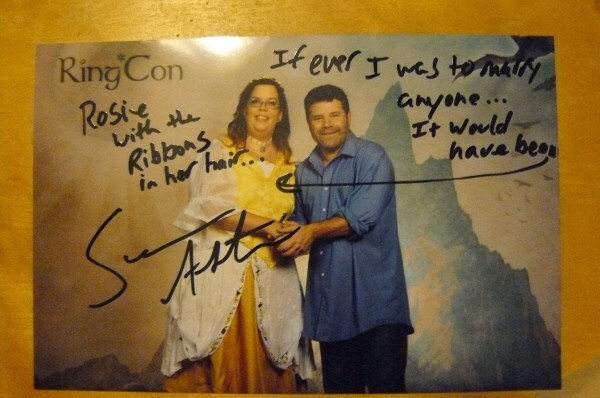 It was that I had gotten the picture with Sean Astin and I liked his autograph to it. Usually a few weeks before the con they put up the programme. At RingCon (and I guess HobbitCon will be the same since it is at the same venue) there is a main stage where they schedule all the artists and the things they think will draw a larger audience. Stars usually have an hour in which they tell something about themselves and take time to answer questions from the audience (some questions are soooo bad, you feel ashamed you are in the audience as well, others are really good). When you have a group of actors from one movie (HP, Twilight, Game of Thrones) they sometimes also programme them together. So you have 4 or 5 stars at one time on the stage. Last year they also did this for Billy Boyd and Sean Astin. That was one amazing panel, in which Billy even sang Pippins song life on stage!!! There is a dealership room where you can buy all kinds of stuff. They also have talks from experts. They are really interesting. The only thing, they are usually in German (and the Germans have translated almost all the names in LOTR so it is hard keeping track of what they are actually saying, even when you understand German). There are photo moments with the stars. You have to buy tickets for those moments and it is all really rushed. But you do end up with a nice picture to take home. Most stars will be walking around at the convention, but they are a bit reluctant to take pictures with you at that moment (probably also because they get part of the money you pay for the picture). But you can take pictures of them, just not with them. There is a time indication on when what star will be taking pictures. There will be a line, so waiting for a picture can take up to one hour. Will also depend on how popular that actor is at the moment. (Last year they organised BloodyCon (a Vampire Diaries convention) and pictures with Ian Somerhalder were so popular people waited over hours for a picture (and that poor guy smiled the entire time) (this is all from what I read on the site, I haven't been there). So I think this year the line for Aidan Turner and Dean O'Gorman will probably be pretty long. There is an art exhibition made by fans. Where the audience can vote and the winner gets a price. And usually there are also workshops like singing, dancing, stagefighting, make-up, aging of costumes, improvisation (Lori Dungey, Mrs. Bracegirdle does that one, and it is hilarious). And a lot of the visitors come dressed as their favorite character. So a lot of looking around as well. And than, when darkness sets in.... the bar opens! The audience at RingCon is usually not too pushy towards the stars and when it is calm and they feel at ease, you will find them in the bar, chatting with the fans and enjoying German beer (don't ask for picture, a round on you for the entire bar, and it will be busy ). Oh, and of course eating. You can buy vouchers for dinner. But they also have a kind of take-away that is amazing, tastes great and isn't as expensive (pizza, pasta, shoarma, potatoes). Well, you see, enough to do. And you always meet friends you haven't seen in months. So a lot of catching up to do as well. Sounds like a fun time even when one doesn't hunt for signatures or pictures. And you don't have to tell me bout the German Tolkien transations. I am German, but only read and watch Tolkien in English, I don't like the German translations of names and places. Especially Bruchtal sounds so... rough. Maybe I'll ask my cousin if he wants to go. He is a nerd (that's not an insult anymore, right? ), so it might be his thing. are usually between 20 and 30 euro (autographs same price). It depends on how well known the star is. Ian Somerhalder at BloodyCon last year was 50 euro. Some of the minor stars of Harry Potter were 15 euro. So if you go for 25 euro per photo, you will be fine. At RingCon they usually have the Kiwis (the stars from NZ, Craig Parker, Mark Ferguson, Lori Dungey and who ever is happening to come from NZ) do a group photo. But those guys are more for fun at RingCon than for serious business, they also only ask 20 euro. I think they might do group photo sessions for some of the dwarves. Those might be more expensive. So 10 dwarves and a wizard! This is going to be epic! And of course also Daniel Falconer, Paul Tobin and Emil Johansson (from The Lord of the Rings Project). Been talking to my friend and we're both up for meeting some new people at HobbitCon, so if anyone want's to meet up (especially since a few of you said you'd be alone) just post away and maybe we could arrange something before hand? Of course I'm willing to meet new TORn-friends. It is always fun to have a moot in real life. I think we best wait until the post a programme. So we know when we will be too busy listening to the stars or when we will have time. So nothing set in stone yet, but for those debating whether to come alone or not, well the offers here! The train ticket from Stuttgart in southern Germany, then staying in the hotel, the ticket, the food, the autographs, I think all of that would easily amount to about 500 euros, and that for just two days! That's almost my entire pension for one month. But I'd so muchlove to meet some of you.... I've never been to a convention before so it would really be fun. Still waiting for my tax refund, and if I could sell some of my books to friends, and sell the little portable tv that I won in a raffle, and some more of my homemade jams and jellies, and not buying any sweets for the rest of the year, much less new clothes or shoes, perhaps I could scrape the money together. Will any of you be staying at the hotel where the HobbitCon will take place? If one shared a room, it might be more affordable (they seem to have double or three-bed rooms). Alas, no one among my friends here is even remotely interested --- in fact, if it weren't for TORnsibs to share my enthusiasm, I'd probably spontaneously combust! I'd have to stay at that particular hotel because I'd have to lie down for an hour or so every now and then, otherwise my back would killl me after the first day. Unfortunately we have to inform you that Aidan Turner has just now cancelled his appearance at our RingCon Special There and back again, the HobbitCon, due to filming commitments. Aidan Turner has really tried to set his filming schedule around HobbitCon, but unfortunately it doesn�t work. He had no other option than to cancel his appearance. to stay at the hotel itself. Expensive, yes, but since I have to lie down every now and then for half an hour or so due to my bad back, I don't really have a choice. Triple rooms are the cheapest, and so I'm wondering if anyone would like to share with me. I don't smoke, nor do I snore (or so I've been told). I also won't come in at 3 a.m. dead drunk and crashing into the furniture. I'll have to forgo photos with the stars and autographs, I think, but it would be so much fun to be there and meet some TORnsibs as well! Probably will have to stay four nights because of travelling there and back again. is absolutely normal at RingCon. If you register for a three person room, they will hook you up with room mates. And they keep it all male or female, so no worries with that. And I have never had trouble with noisy roommates. I think the ones who are the parties and late night crashers are the ones who have friends with them in the room, so other guests are not bothered with that. Dress up isn't necessary. If you don't feel comfortable about it, than just don't. There are lot of people in every day clothing. But also a lot of people dressed up. They are also fun to watch and are of course willing to have their picture taken. I just checked the Hobbitcon website and they have listed a schedule (perhaps not the ultimate version yet but gives us an idea of the stuff that's happening). Everything with an E presumably means that it will be in English so that should be fine for all you non-German speakers. I was having a look at the schedule the other day, I think I'm just not enough of a ringer to feel comfortable there. But I wish everybody lots of fun and am hoping for recounts and pictures.